So we all know I'm a blogging slacker. Did I ever even announce my pregnancy on the blog? Probably not. Well guess what! Baby #2 is due November 30! 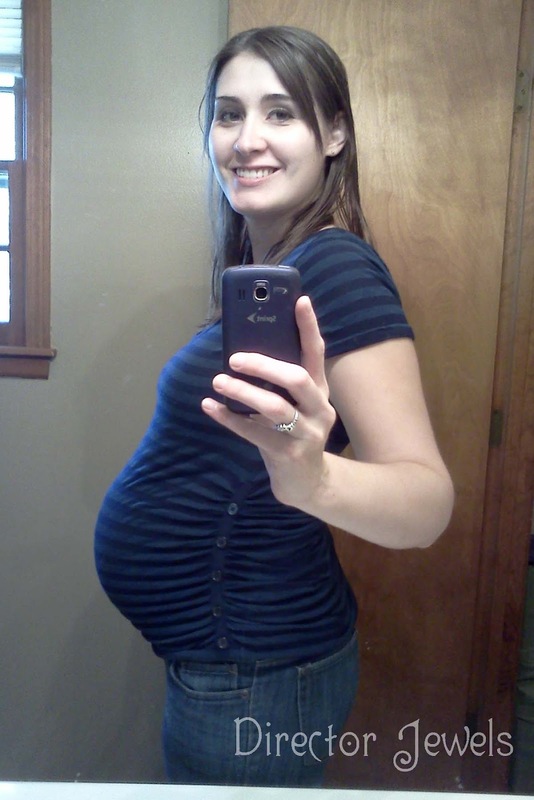 But my laziness is no reason to skip this fun weekly bump update, right? That's what I thought. Weight gain/loss: I'm up about 30 pounds. I don't keep track very well and it's confusing anyway since my pre-pregnancy weight with this baby was 10 pounds under my pre-pregnancy weight with Lincoln and I still lost weight at the beginning of the pregnancy. Let's just say I'm starting to feel kind of like a whale. Feeling: Excited that this pregnancy is 75% (or maybe more) done! Also a little overwhelmed by all of the things I want to finish before baby arrives. No big projects for baby - just things I am tired of having hanging over my head. Maternity clothes? Yes, definitely. Hoping the weather gets even cooler so I can wear some of my favorite maternity clothes from when I was pregnant with Lincoln! Sleep: Not enough. And I wake up too frequently between Lincoln fussing and my three-to-five nightly visits to the bathroom. My whole body has started this great "aching" feeling too, I told Andrew last night it's about time to break out the giant body pillow. Food cravings: Lemonade. Alfredo. McAlister's Deli (I want this every single day). Gender: Girl! Our house is filling up with pink and purple things for miss Adelaide Rose. Movement? She's usually wild, but has been a little quieter this week. She likes to stick her hand/foot in my belly button (which has been "out" since about week 10) - I think she likes the tiny little cavity of extra space. What I miss? Caesar Salad. I am planning to pick one up via takeout on my way home from delivering her. It's that bad. Best moment this week: Touring a birth center and making the decision to deliver there instead of at the hospital. It's going to be a somewhat further drive, but I felt so relaxed and peaceful at the center - it is so much more suited to the natural birth experience I am striving for this time around. What I'm looking forward to: A nice, calm weekend with hubby at home. Maybe some yummy food (that we don't have to cook) since I have lots of birthday offers in my email inbox? Next Appointment: Tuesday, September 25 (my birthday). I have an hour-long appointment to meet one of the midwives at the birth center and get everything switched over to their care. Excited!